I come to St. Philip's from the Cathedral of All Souls in Asheville, NC, where I joined the staff in the fall of 2006 and have been serving as the Assistant to the Dean. Previously I worked as the assistant director of the Tennessee Justice Project and spent a year working at an orphanage in Honduras with the Young Adult Service Corps. I also worked five summers as a counselor at Camp Henry. I graduated from UNC-Chapel Hill with a degree in religion, received my Master's degree from Harvard Divinity School and did work in Anglican Studies at Virginia Theological Seminary and Episcopal Divinity School before being ordained as a priest in 2010. 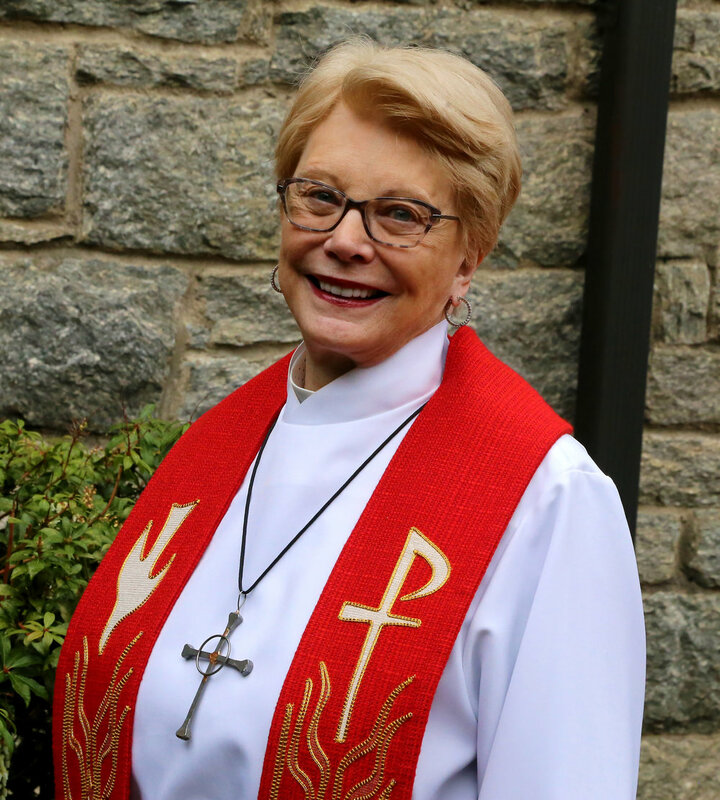 I am active on numerous diocesan committees and have been elected twice to the General Convention of the Episcopal Church as a clergy delegate from the Diocese of Western North Carolina. My wife, Amanda, and I currently live in South Asheville with our three children Tav, Charlie and Eloise (ages 9, 7 and 5). We spend every moment we can outdoors. I have been serving as Deacon at St. Philip’s since August 2013. I was ordained to the order of deacons in January 2003 in the Diocese of Mississippi, where I worked until the end of 2009. Following a couple of years in Hickory, NC, at St. Alban’s, my husband, Bill (who is a priest), and I moved to Brevard, where we enjoy the seasons, the small community, and the varied opportunities to enjoy the arts and the beauty of nature. I have come to appreciate many aspects of parish life, from pastoral care to outreach to community involvement. I advocate for St. Philip’s to be a community that cares for and loves one another and that extends this care and love to others in the local community and beyond. My life in “the ministry” has been one of resistance and trying to say no. While working as a research chemist in atomic energy at Oak Ridge, TN, I experienced my first “call.” I just knew that the Lord was mistaken, that I was not the one he needed. However, after some time I decided to test the waters and entered seminary. This led to ordination and the beginning of my ministry in the Church. In the 1970s my wife and I became interested in Jungian Psychology and we held a teaching mission in my parish in Jacksonville, FL, to combine Jungian Psychology and Christian spirituality. On the last day, we invited the community to join the seminar and had an overflow crowd (so much so that the septic system of the parish hall overflowed). The popularity of this and a second seminar prompted us to launch a series of “Journey into Wholeness" conferences that we ran for 30 years. In retirement, I have ministered as one of the adjunct clergy through St. Philip’s Parish in Brevard, now caring for the Episcopal residents of College Walk Senior Living with a monthly Holy Eucharist. Born and raised in Mount Airy, NC, I was active in both parish and civic life while growing up. As an adult, I moved with my two children to the Detroit area, where I worked in marketing for Bell Telephone for nearly 20 years, until going to seminary in Cambridge, MA. I attended Episcopal Divinity School while working in the school’s development office. After receiving my M. Div. and Doctor of Ministry degrees, I became rector of the Church of the Good Shepherd in Watertown, MA, and remained there for 18 years; served as Dean of the Alewife Deanery for six years; and continued my work at the seminary on a part-time basis. After retirement in 2010 we moved to Brevard, returning to my beloved Blue Ridge Mountains and joining St. Philip’s Episcopal Church. 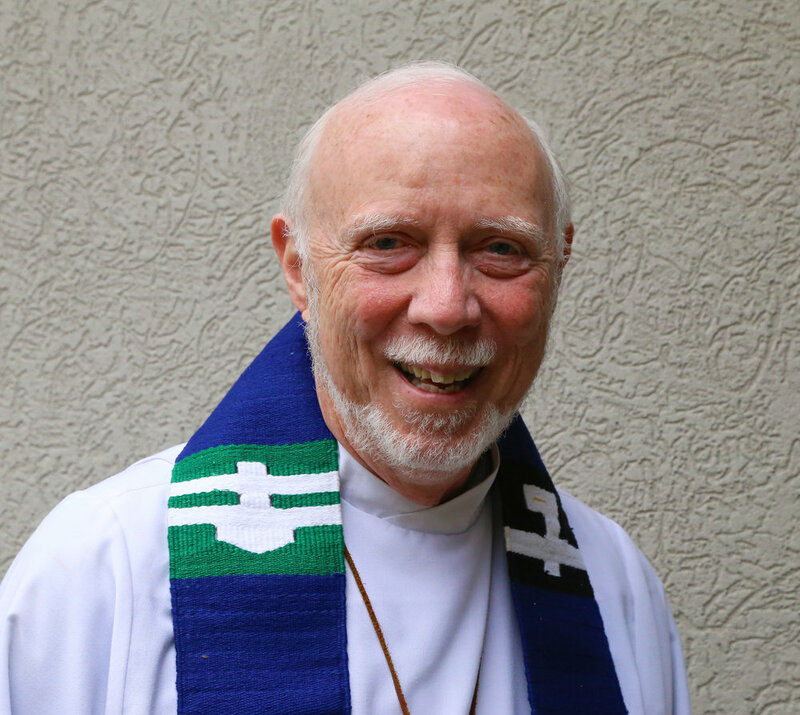 As an Episcopal priest, I have been blessed with a rich and varied ministry. In 1980, I was ordained in the Diocese of Pittsburgh, PA, and spent my first years as a priest on the staff of Trinity Cathedral in downtown Pittsburgh. I went from there to a small, inner city mission on Pittsburgh's North side where I served for seven years. In 1993, I moved to Princeton, NJ, where I served as Rector of All Saints' Church for 10 years. In 2004, I became an appointed missioner of the Episcopal Church and served for six years as Executive Director of El Hogar Ministries in Honduras -- the same ministry to children and young people from backgrounds of severe poverty at which our Rector, Father Thomas Murphy, spent a year as a volunteer. While in Honduras, I met another missioner, Dr. Barbra McCune. We married in 2009. Wanting to return to parish ministry, we left Honduras late in 2010 for White Plains, NY, where I received a call to be Rector of Grace/La Gracia Church. This was an exciting and diverse downtown parish very involved in community ministry. After my retirement, Barbra and I moved to Brevard, NC, in November of 2017 . I am grateful we have found such a vibrant and welcoming community at St. Philip's and I look forward to being part of the new beginning for the parish under Father Thomas' leadership. I've been an adjunct priest at St. Philip’s since retiring from full-time ministry in 2011. After working in public mental health services for 23 years, I attended seminary in Austin, TX, and was ordained as a priest in 1999 in the Diocese of Mississippi, where I served as parish rector and, following Hurricane Katrina, as Canon Pastor-Missioner providing support to clergy and clergy families and to 12 damaged/destroyed parishes. Since 2009, I have served parishes in the Diocese of WNC as full- and part-time interim rector. I'm an emotional wellbeing staff member of CREDO and a consultant and trainer on emotional and spiritual recovery after disasters for Episcopal Relief and Development. I also advise vestries and parishes on visioning, transition, stewardship, conflict resolution, and mutual ministry review. My wife, Diane (our Deacon), and I chose WNC because of our love of the mountains and hiking. The abundant recreational opportunities, performing arts, and good restaurants and the small community atmosphere drew us specifically to Brevard. My interests include photography and traveling with Diane. We have three adult sons and three grandsons. I'm a retired American Baptist pastor and a long-time member of the Alliance of Baptists. I have served as a local church pastor, nursing home chaplain, and hospice chaplain. I was received into the Episcopal Church and became a member of St. Philip’s, where I now serve as a Pastoral Associate for pastoral visitation. In addition, I'm active in one of our Centering Prayer groups, coordinate the St. Philip’s Prison Ministry, and preach occasionally. I volunteer at The Haven shelter overnight once a month. My wife, Carol Moore, and I have two adult daughters and two teenage granddaughters. We retired to Brevard in 2011, and have no regrets about doing so! My call to ordained ministry came at church camp when I was a youth growing up in the Evangelical United Brethren Church in Ohio. After getting my undergraduate degree at The Ohio State University, I attended Princeton Theological Seminary and then was ordained in the United Methodist Church. Two summers of field work as a chaplain at the Philmont Scout Ranch in New Mexico inspired a 31-year career in youth ministry with the Boy Scouts of America. My next adventure came in the form of a second career as a development officer at my alma mater, where I directed a capital campaign to build the Ohio 4-H Youth Development Center. Yes, I exchanged my scouting fleur-de-lis for a cloverleaf! 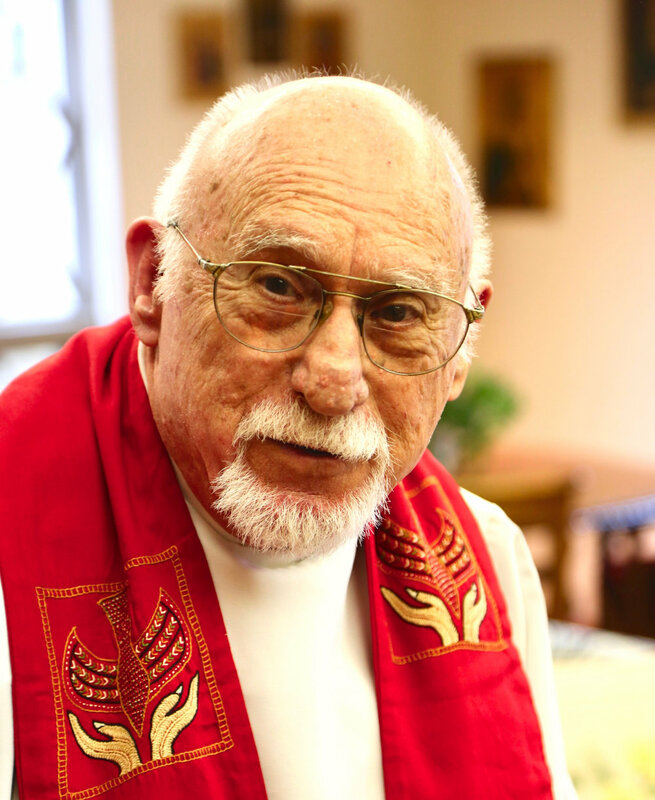 My third, and final, career was as an Episcopal priest serving two small but mighty mission congregations in the Appalachian region of southeastern Ohio. After attending a conference at Kanuga several years ago, my wife, Linea, who is an ELCA pastor, and I fell in love with the mountains of western NC and decided to retire here. We clearly see God’s hand in leading us among kindred folk who love this sacred place as much as we do. Thanks be to God! I am a born and bred Lutheran with Ohio roots. However, the church of my youth, the Lutheran Church–Missouri Synod, does not recognize female pastors. So to faithfully follow my early childhood call to ordained ministry, I became a member of the Evangelical Lutheran Church in America, where I was ordained in 2012, following careers in education, real estate, and retail. I am a graduate of Ohio University majoring in education and economics, and attended Trinity Lutheran Seminary in Columbus, Ohio. After serving two rural churches in Southeastern Ohio, my husband Bill (an Episcopal priest) and I fell in love with the mountains of Western North Carolina while vacationing and decided to retire here in 2016. I have a passion for Christian education, preaching, and pastoral care for the elderly. My hobbies include floral arranging, painting, reading, and knitting. I am blessed with three children and six grandchildren. It is my joy and privilege to serve as chaplain to the Episcopal Church Women of St. Philip’s. A native of North Carolina, I grew up in Fayetteville, went to High Point University and served a university professor in medical sciences after college and graduate school (University of Florida). I moved north to attend Yale Divinity School; now I have come home after 30 years in New England and Washington, DC. Following posts in CT and RI, I served as rector of Christ Church in Washington Parish on Historic Capitol Hill for 12 years, and Christ Church Episcopal in Harwich Port, MA, on Cape Cod for almost ten years. In addition to acting as chair of liturgy commissions in two dioceses, I have served the Episcopal Church in diocesan, regional and national roles. I loved being a volunteer chaplain at the Washington National Cathedral in Washington, DC, for 12 years as well. On Cape Cod I was very involved in Habitat for Humanity. My spouse, The Rev. Dr. Anne E. Gilson, also an Episcopal priest, our almost-16-year-old son, Jamie Gilson, and I moved to Brevard this spring, and we are happy to be at St. Philip’s. Jamie plays drums and sings baritone, and he and I plan to be involved in choral music here. We both enjoy golf as well. I am loving retirement and enjoy polishing my birding skills and being involved in the local and state bird clubs. I am also studying to be an Oblate of the Benedictine Sisters of Erie, and I am working on a book on imaging the Psalms of nature in painting and photography. I retired from Columbia Theological Seminary where I served as Director of Spirituality Program, a certificate program in Christian Spiritual Formation. While at Columbia, I worked in spiritual growth and renewal with church leaders from a wide spectrum of geography and theology. This experience confirmed for me that there is a great hunger for God throughout our society. And folks often don’t know how to “Be Still” long enough to experience the richness of that relationship. I am a second career pastor (having worked for 17 years in the pharmaceutical industry), during which I served three churches: one in OK and two in GA. I am an ordained Minister of Word and Sacrament in Western North Carolina Presbytery, with degrees from Emory University, Princeton and Columbia Theological Seminaries. My passion is for teaching about spiritual formation and the spiritual components of depression. While at Columbia, I also led 5 spiritual pilgrimages for Pastors to the Holy Land. My wife, Sebring, and I retired to Brevard, NC, where we are living out a 40-year dream to live on a small farm in the mountains. I enjoy nature and find a deep connection to God through the beauty of the area. I garden, hike, canoe, fish, camp and work on our property in Brevard. My current interest is in the area of eco-spirituality, small group ministry, community farms and how to bridge the gap to spiritual seekers outside the church. Sebring and I have been married for over 50 years, have 3 children and 7 grandchildren, five of whom are in the Asheville-Brevard area. My husband Rick and I moved to Brevard four years ago after living in Atlanta for most of our lives. I'm a graduate of Emory University and The Candler School of Theology. I had the opportunity to serve as Chaplain at Emory University Hospital in the areas of Oncology and HIV/AIDS. I also served at Egleston Hospital for Children, a part of Children's Health Care of Atlanta, and I served at Saint Mark United Methodist Church in Atlanta for 20 years as Minister of Outreach and Pastoral Care. During this time I worked closely with the homeless community, women and children who were in domestic violence situations, and people living with HIV/AIDS. My pastoral responsibilities included preaching, teaching, pastoral care and outreach to the community surrounding a large inner city church committed to social justice and God's call to helping the poor, oppressed and marginalized in Atlanta and the world beyond. Front Row L to R - Phil Seymour (2021), Lynn Adams (2020-Senior Warden), Gena Hawk (2021), Barbara Boerner (2019) and George Benton (2019). Back Row L to R - Fred Brown (2020), Cindy Rudd (2021), Carrie Collins (2019) and John Rinehart (2020-Junior Warden).